With Thanksgiving quickly approaching, we’re excited to start collecting cozy, warming recipes to enjoy this winter season with friends, family, and community. 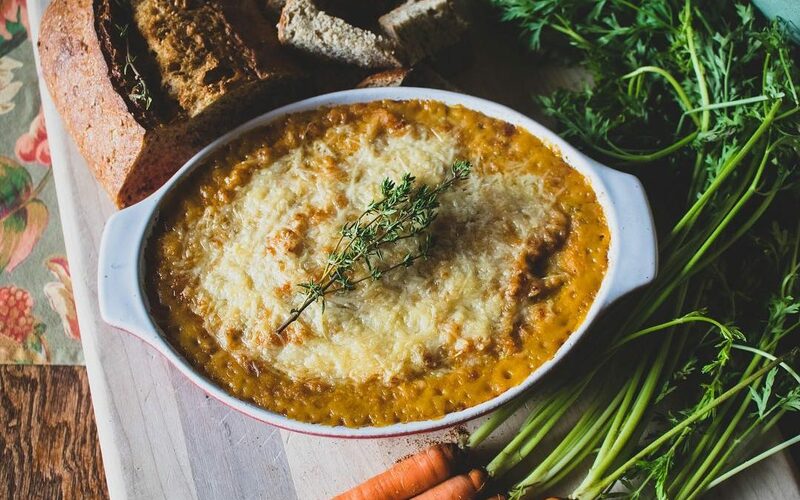 To kick it off, we whipped up this simple and delicious Butternut, Parmesan, and Herb Dip that will be perfect for tiding guests over while waiting for the main event. On second thought, this is so good we might not even be hungry for turkey! Enjoy! Preheat the oven to 425 F, and prepare a medium-sized baking dish. Combine Butternut Squash Puree, olive oil, 1 cup parmesan cheese, nutmeg, milk, seasoning, and diced herbs in a large bowl. Stir until well incorporated. Spoon Butternut Squash mixture into prepared baking dish, and sprinkle remaining 1/2 cup cheese on top. Bake for 10 - 15 minutes, or until bubbling and slightly browning. Set the oven to broil, and broil for 3 - 4 minutes, or until the top layer of cheese is golden brown to your satisfaction. Let cool for 5 minutes, and enjoy! Serve with a hearty loaf of bread; vegetables like carrots, celery, bell pepper; or crackers.